At times, government and nonprofit agencies develop policies and programs which offer services without input from the communities said decisions will impact. In these instances, the agency or organization is the sole provider of community services. Ostrom argued “the production of a service, as contrasted to a good, was difficult without the active participation of those supposedly receiving the service.” Therefore, to develop and strengthen sound community services a partnership between administrators and residents is necessary. Coproduction may be such an avenue in achieving sound community services. Coproduction characterizes “the potential relationships that could exist between the “regular” producer (street-level administrators) and “clients” (community residents) who want to be transformed by service into safer, better education or healthier persons.” When combined, the collective actions of citizens and public organizations have the potential to enhance the quality and quantity of public services for communities. An example of such a partnership is between the Los Angeles Fire Department (LAFD) and a South Los Angeles nonprofit organization working in violence intervention. Historically, when responding to emergencies in South Los Angeles, the LAFD would stage. The widely used practice suggests emergency responders, upon arrival at a scene, set up a few blocks away from the emergency and wait for police to secure the area. Once the area is secured and safe, responders would then attend to the emergency. In South Los Angeles, the LAFD are responsible for fire prevention and providing emergency medical services (EMS), so staging became particularly problematic. Staging resulted in delayed response times and ultimately, a disparity in the delivery of services. As a result, there was an increase in discord and a decrease in trust between community residents and the LAFD. The dissonance and lack of trust that has grown from the use of staging created an environment in which community residents did not feel protected or valued. Consequently, residents did not see the LAFD as a helping organization; rather, citizens categorized them as an organization of power, aggression and uniforms. Ultimately, the LAFD realized they needed to better serve the emergency response needs of the South LA community and develop avenues to offer equitable services throughout the city. 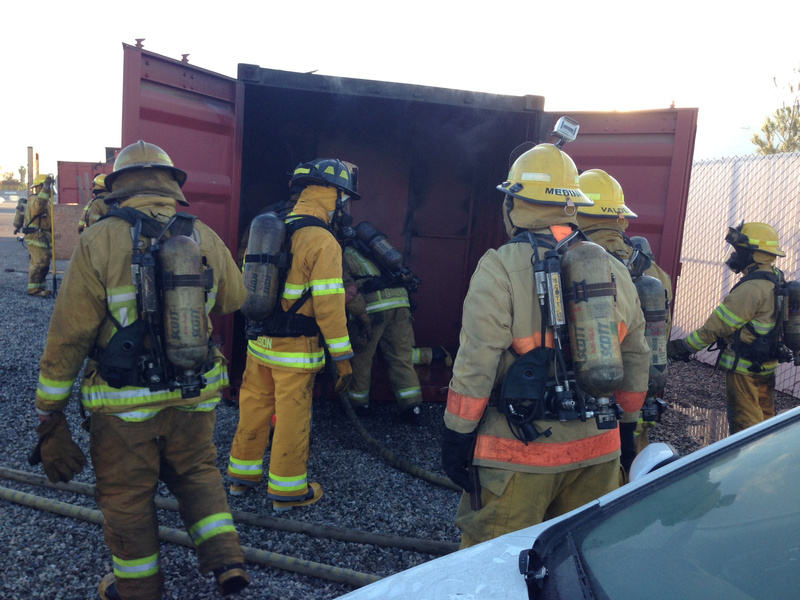 Recognizing a lack in equitable service delivery, the LAFD partnered with violence interventionists to train fire and rescue staff serving the communities of South Los Angeles. The LAFD understood they lacked specific expertise and worked to establish a coproductive partnership grounded in bi-directional training. This relationship would increase avenues which allow fire fighters to effectively and responsibly conduct their professional duties. As a nonprofit organization designed to provide practitioner driven community based violence intervention and deterrence training, violence interventionists trained LAFD members to quickly assess an environment, offered strategies to navigate gang culture, identified proper and improper ways to interact with community and gang members, discussed the importance of body positioning and language, addressed violence intercession, and suggested appropriate de-escalation tactics. This training, for the LAFD, provided firefighters with the cultural competency needed to engage and interact with community residents whose culture they may or may not be familiar. On the other hand, the fire department trained interventionists on life saving emergency techniques and on the policies and protocols of the fire department. Members of the LAFD provided cardiopulmonary resuscitation (CPR) training for interventionists. These skills, for interventionists, are particularly vital because they are community residents, and are often at the scene of an emergency before the LAFD. Equipped with these skills, interventionists are able to immediately provide life saving measures to those in need of assistance. The importance of sharing department protocol stems from the liaison role interventionists play between the community and LAFD. For instance, interventionists may aid the LAFD by controlling crowds which gather after a violent incident and are able to explain to residents what an emergency responder is doing at given moment. The ability to communicate effectively with both residents and responders reduces the potential for misunderstandings. For example, residents may perceive a lack of care and compassion by an emergency responder when seen on the phone rather than understanding responders are informing the local hospital of the conditions of the patient that will soon need emergency care. Misperceptions, by both residents and firefighters, can lead to anger, frustration and drastically decrease the safety of firefighters and residents. In this case specifically, coproduction has led to an increase in resident trust, a decrease in the discord which existed between residents and LAFD, educational and training opportunities for both community residents and administrators, and the reduction of staging practices. Evident in this example is the importance of deliberation and dialogue as it served as the crux of this partnership and was instrumental in promoting and enhancing coproduction. The work of the LAFD demonstrates how coproduction can have real, tangible impacts and can work to strengthen relationships between communities and public administrators. Coproduction has the potential to allow public organizations to engage in embedded practices that serve communities in efficient, effective and equitable ways. Author: Tia Sherèe Gaynor (preferred pronouns she/her/hers) is an assistant professor in the Department of Public and Nonprofit Administration at Marist College. Dr. Gaynor’s research examines issues of social justice and equity within a U.S. and global context. Her scholarship can be categorized as follows: resident participation and engagement; public and social policy analysis and implementation; and pedagogy, learning and instruction. Email: [email protected].